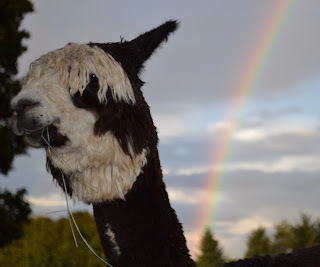 My Handsome Herdsire Bad to The Bone and a rainbow's end. 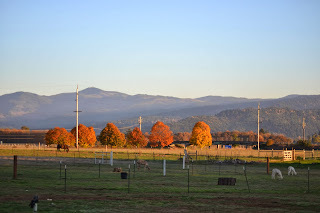 My first year on my farm in the Willamette Valley of Oregon, I had to get used to rainier weather. We sure didn't get the quantity in Southern California as we do here in Oregon. I enjoy the weather here. I was curious to see how the alpacas would adapt to it. They didn't seem to mind it too much that first year although Jamilah came to me shivering a few times in the beginning. We all acclimated pretty quickly. They also learned to appreciate their shelters. I'd laugh at them as we would get a little sprinkling and they'd run like mad to their shelters. I'd think what wimps as I was out there raking away. It wasn't quite yet teasing them about what wimps they were about getting a little damp when the rain would start falling more rapidly and I'd get soaked. This two-legger turns out not to be the sharpest one of the herd because it took me awhile to stop teasing them and listen. It took quite a few soakings before I realized that they were sensing when heavier rain was coming. After observing them for a few years now, when the herd meanders in with a light rain, I know I have a little time to get done what I'm doing. If I see them running for shelter, I know I better hurry and get myself in real quick because it is going to pour. They are rarely wrong. Once in awhile, their predictor is off but more times than not, it is as accurate as can be. They must sense the difference in pressure. I have no idea how they do that but I have gotten a lot smarter about listening to them. The last laugh was on me for teasing them. 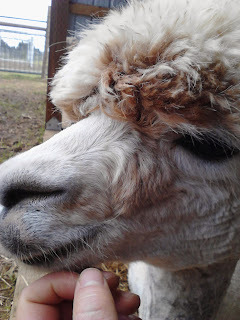 Alpaca weather predicting was another example of us two-leggers (me) thinking I was so much smarter than the alpacas. We can learn so much from our animal friends if we check our egos at the gate and just listen and observe. Some days I don't have a choice and need to stay out and get rained on. That is what rain gear is made for. But on days where I really don't feel like getting soaked to the bone and being poured upon, I listen to my alpacas. Maybe a few meteorologists could get a pointer or two as well! 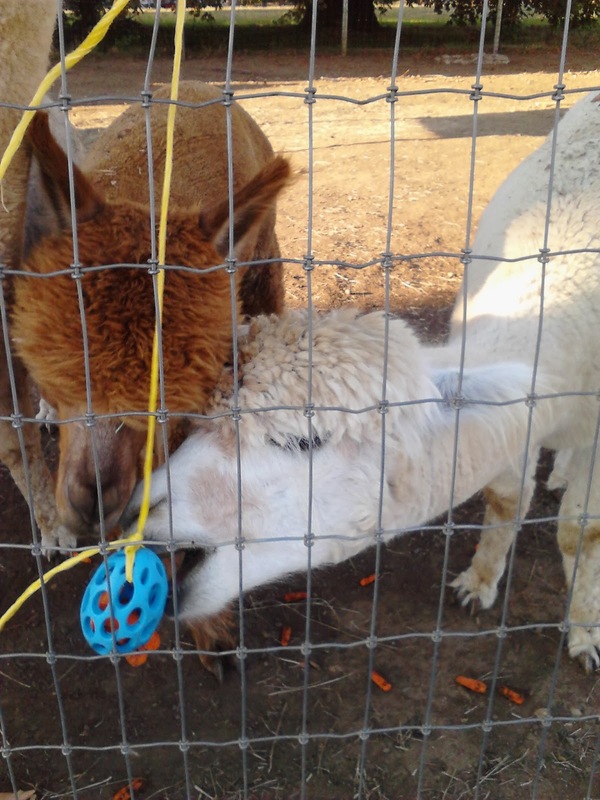 This blog is written to those who are interested in buying alpacas or newly into the alpaca business and building their herd. There are a lot of alpacas out there for sale. Lots of folks liquidating their herds for lots of reasons. I have had many new people come through my farm gate, learn a lot from me and then find these great deals out there and buy from them. I have bought a couple myself. Those that I purchased stepped up my breeding program immensely and I knew what I was getting and what I was hoping to achieve by getting those alpacas. I knew exactly the quality and genetics I was buying. I do not discourage buying those sale alpacas. But, there is a difference in buying from someone staying in business. I have dropped my prices yet I refuse to drop them to liquidation prices because I believe you are getting something beyond owning an alpaca. When you are trying to make a sale, it is important to spell out clearly for the buyer the "What's In It For Me" or "WIIFM" from their perspective. What does that alpaca, product or service going to do for them. 1) Mentorship. 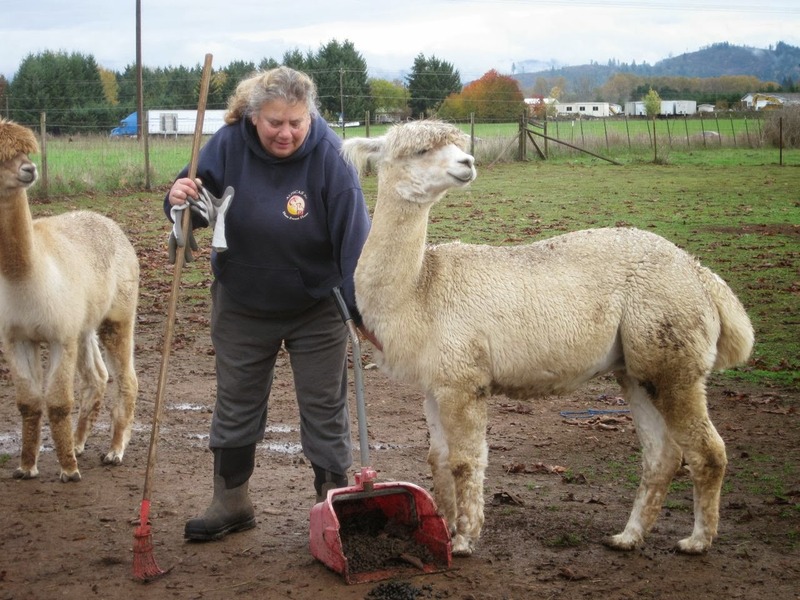 Everyone of my new alpaca owners and even ones with experience have called me with questions and many of those are emergency sort of questions requiring a quick response or having someone walk them through a process. I have talked folks through how to feel for a stuck leg and what signs to look for during a difficult delivery. 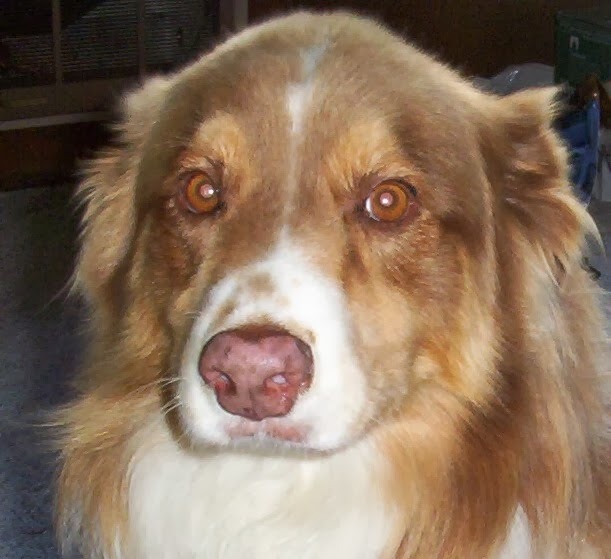 I have had others with a sick animal and offered other ideas of things I've done since a vet isn't always available until a day or two later. 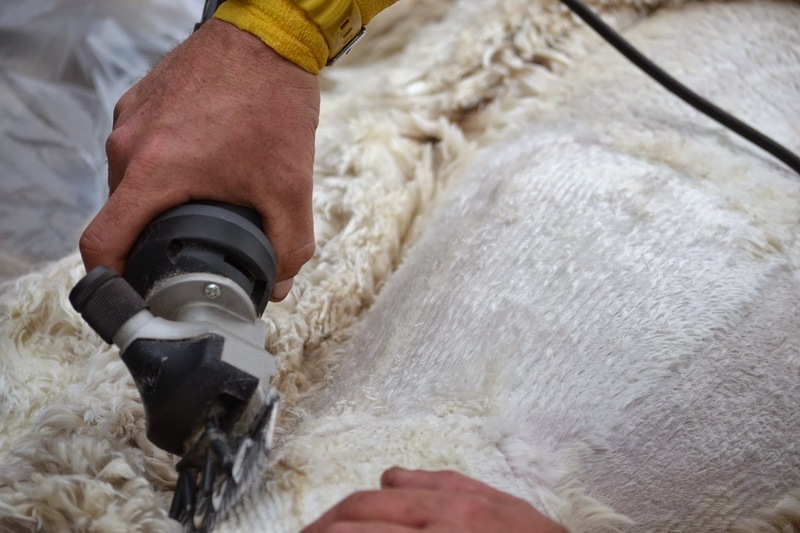 I have run over to farms to assist in all sorts of activities from herd health, shearing and births. You get someone that helps you and suggests and shares ideas of how to get your business growing. I teach how to trim nails, de-worm, give shots, halter train and much, much more. 2) You have someone that may want to collaborate with you on projects. There is someone that has processed fleeces and knows the various mills around and what they like about which ones and maybe what the market in your area is looking for in a finished product. They also have more knowledge of what might be going on nationally that can help you decide on a niche. They have leads and contacts that might help you when you have chosen that niche. 3) If they have a customer that is looking for a particular alpaca they don't have but know you have one, they may share that lead with you. They may offer a partnership on a herdsire or offer you special deals on stud fees. 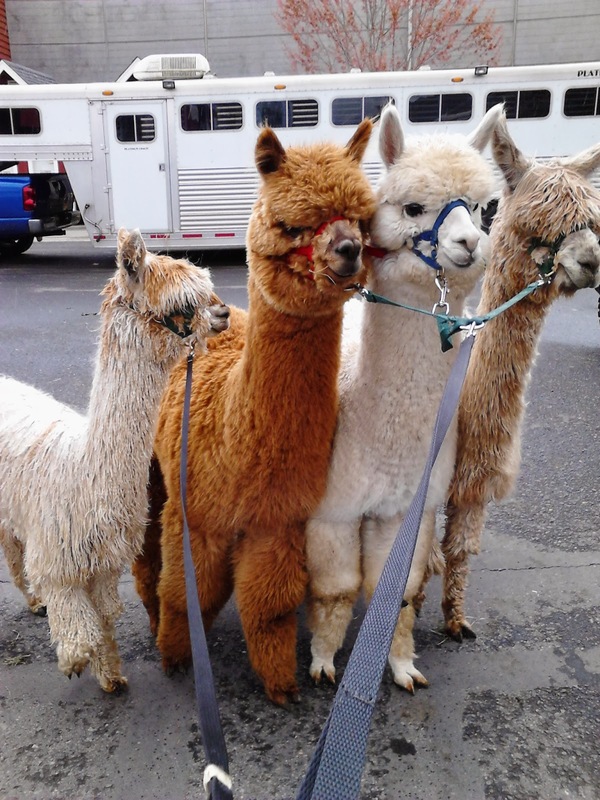 4) They may give you guarantees and be able to fulfill them if there is a problem with an alpaca you purchased. I offer guarantees of a life birth with my studs' services. If something happens to a new born cria, and it doesn't make it or isn't going to be a breeder, I offer a free re-breeding to that male. Will you get that from a liquidator? 5) Finally, buying from someone that is staying in business despite the tough economic times, have adjusted their business plans, adjusted their breeding programs, and created new niches. They are the types of people I look for in buying and doing business with. I know doing so helps my business and to me, I want to help them stay in business as much as I want me to stay in business. Learning from those folks is worth the extra dollars and then some. It has paid off more than once for me! I personally would prefer to learn from others that are successful and staying in business. 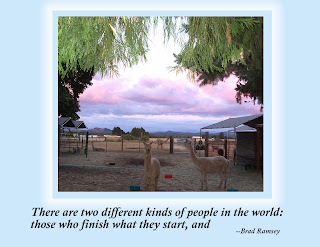 There are days when it seems like I'm alone in my positive attitude about the alpaca business. But today, there was a posting on a group on Facebook and it mirrored all I have been saying. It was such a breath of fresh air reading her post. She listed all the points I've been standing on my soapbox preaching. 1) We need to take responsibility for our own businesses and set the attitude we want. 2) Stop blaming AOBA, ARI, those liquidating their herds, the economy. No one said it was going to be easy and there will always be cycles of good times and bad. 3) This is a great industry with a bright future and we are a part of it. Those of us with passion for these animals, their fiber and have the vision of where we are headed, know we are in the right place at the right time. We are creating something amazing and wonderful. This post was just perfect timing. I had a visit this weekend from my former colleague that was during my life as an engineer. That organization was so negative. It was a horrific environment to work in daily. It isn't easy with tightening wallets and slow sales to maintain that positive outlook especially when bombarded with negative comments about the industry. I have stopped reading much of it because it just depresses me and gets into my head. I don't need to battle those voices in my head. My voices are loud enough at times. Those negative voices are like so many other negative voices out there and it doesn't matter what the career. If they take hold, so many jump on the bandwagon. I saw it when I was at the base. So many of my colleagues from the younger days were so negative. That should have been a time when we were bright, eager and excited about our careers and yet, the whining and grousing was terrible. Why? Because that is what they heard from our leaders and those that came before us. I never heard anyone talk about how great it was to work where we worked. Not once. I saw myself falling into that trap of being negative and whiny too and I didn't like myself much. I knew I had to get out of there before I was as much of the problem as the solution. Those negative voices carry legs. If they shout loud enough, they find followers and they get attention. Those of us that are positive, tend not to respond to those negative voices which allows more and more to follow that self-defeating path. It is perhaps a mistake that we don't raise our positive voices louder. I know for myself, I separate myself from it and hunker down trying to deflect that negativity as best I can and work hard at staying focused on what is right and working well. But the result of that is feeling isolated and alone. When hearing someone else say those wonderful words of positive outlook, I saw myself grasping at it like someone lost at sea thankful for that life boat. What was even better was seeing how many responded. The voices out there also doing like myself doing our best to be positive in our small way, came together as a group and community. What a welcome and wonderful feeling to see all those voices around the country sharing our same philosophy as mine. WE are the future of this industry. Not the negative voices. They are the ones getting out of business! We are the ones staying in it because this is our passion. This is our life. This is our choice! We are rich and successful because we have found that life that is just made for us. We aren't afraid of the pitfalls and downturns. That is going to happen no matter what. We are here with our eyes wide open, knowing there are tough times and loving each and every minute of it. The good, the bad, the ugly. We are making lemonade out of all of it! I had this t-shirt that had a cup with fluid in it and it said underneath the graphic, "Half Full." I thought that was perfect for me but now I have a different philosophy. I say that I try and keep that cup as full as I can because I only want it to go down to half full during my worst times. If we keep that cup only half full at good times, then it can get rather empty during the rockier times of life. So I now say, keep that cup full. My goal is for my cup is to runneth over. And most days, it does just that. I feel my heart fill up as I watch my babies play and it filled up to the top today after reading someone else's wonderfully positive post! Being an introvert has been a challenge when it comes to being in the public and meeting new people. Since owning alpacas, it has become way easier to strike up conversations with new introductions. When I worked as an engineer, I noticed after many years of this happening, that when I first met someone, as soon as I was asked what I did for a living and I responded I was an engineer, the response was most often, "That's nice,"or, "That's interesting." They'd smile, turn and walk away. At best, I'd get asked what kind of engineer and then they'd walk away. I told my mom what I experienced when I met new folks. She didn't quite believe me. Then one time we went to some social function of hers. She introduced me to one of her friends. Her friend asked me if I was the daughter that was a teacher. I said no, I was the daughter that was an engineer. She did the standard reply of that is so interesting, turned and walked away. My mom waited a few moments and whispered to me, "they really do walk away when you tell them you're an engineer!" I replied, "I told you so!" A part of me took my rejection sort of personally. I figured that I was either very uninteresting or people didn't like me. But I knew I was pretty nice so it didn't quite jive that folks would just walk away like that. Then I realized engineering was somewhat intimidating to folks. They just didn't know what it was beyond knowing there were different kinds. They couldn't relate to it and instead of being curious, they just walked away. However, for someone who is rather shy to begin with, and during an age when you should be learning better social skills in dealing with meeting new people, I wasn't given a good chance to practice. Once someone turned and walked away, I certainly didn't pursue them and say, "Hey wait, I'm not done talking!" Ha! No, instead I went right into my wallflower mode and went invisible. I went back to school and earned my Master's degree in Counseling and thought, well that should be less intimidating to folks. That wasn't why I went into counseling but having gone to some social functions and still getting the walk away after saying I'm an engineer, I figured I'd try saying I was a counselor instead. I have a new career I can use that people won't walk away from me. However, what happened was one of two things. I either got people now telling me all their problems and wanting a free counseling session or I'd get the exact same response as when I told folks I was an engineer. That puzzled me until I realized that they thought I was probably psychoanalyzing them which of course I wasn't. Strike 2 on having a career that was a good conversation starter. Then I got alpacas. 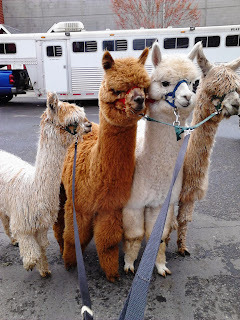 Not long after I got my first alpacas, I was invited to a rather large social event for some dear friends. They were having a formal dinner party at a hotel to celebrate their anniversary. We had assigned seating and the table I was at, I slightly new one couple but the rest of the table were people I had never met before. I saw that and my heart sunk a bit as it felt like it could be a long night of me sitting there working very hard to have conversation with strangers. I really stink at chit chat. It wasn't long after we were all seated, the dreaded question came up of what I did for a living. I wasn't doing engineering anymore and I wasn't counseling either. Well, they couldn't get up and walk away so I said I breed alpacas. I got some laughs and exclamations of, "Really!" Then came one question after another. They were so interested and intrigued by it all. I answered all the questions and shared fun anecdotes. Our table laughed more and we all had the best time. I later found out that many shared with our hosts days following the party how much they enjoyed our table and were so entertained by the alpaca stories. Having alpacas has definitely made it so much easier to strike up conversations with people. Moving to Oregon has helped too since it is such a friendly state. You go into a store and wait in line and people talk to you. Thanks to alpacas, I'm finally getting a little better at that skill of that introductory conversation. 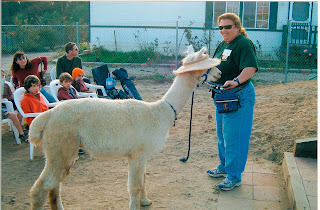 It is another alpaca oxymoron that such a shy and skittish animal makes the best ice breaker! Now that I'm an author of a new book, Alpacas Don't Do That, I am learning a lot about public speaking and so enjoying when folks come up and talk to me about what stories have resonated with them. 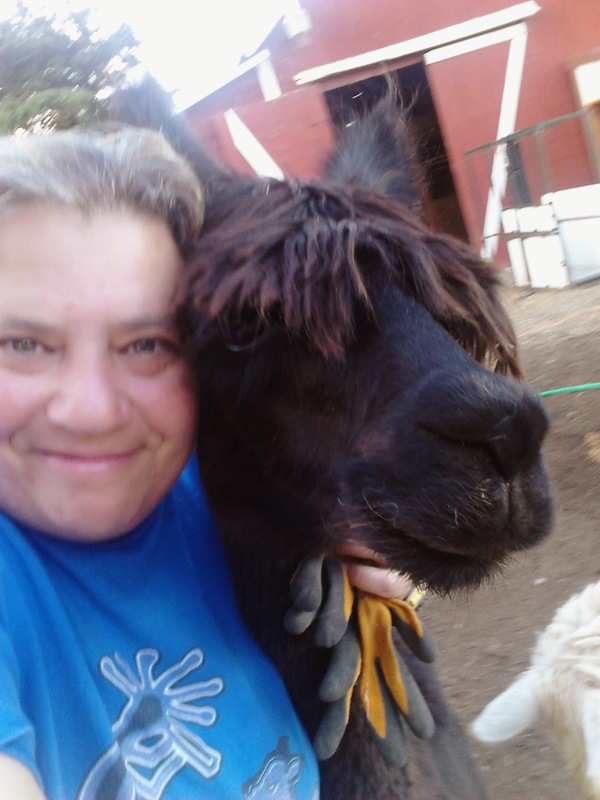 If you have a favorite story to share of your own of your experience with alpacas that have taught you a life lesson, I want to hear it! Write to me at cindy@humsweethum.com. You know it is going to be a cranky day when you have deadlines and your printer jams and then breaks completely. Nothing is more frustrating when my tools don't work especially when there isn't time to figure out how to get things working right. I have to admit, I have no patience for such things. As a former engineer, I get on my soapbox and grumble to anyone and no one about how poorly things are made. It is planned obsolescence and intentionally made to break within a couple of years so you have to go out and buy a new one. They are never worth going out and fixing. I had to buy this printer not because the previous one was broken, but because I had to replace a computer and the old printer didn't have modern enough drivers to download to the new computer. I was forced to replace a perfectly functioning printer. Boy did that irritate me to no end. When you are used to making do and using materials on the farm to make things work, I get really cranky at technology that has the opposite philosophy. If you replace one thing, it becomes this cascading, domino issue. Replace one item typically leads to replacing a ton of other things. I hate waste! Technology is amazing and we have become so dependent on it and when it works, it is fun and such an important tool to running a business, but when it doesn't work, nothing makes me crankier. I was in a better mood by the time of feeding, but I still had a cranky hangover. It wouldn't take much to make me grumpy again. I went through my chores and fed the alpacas their pellets. I have two small groups that I put in catch pens to eat. They are the passive alpacas and one group are my yearlings that are easily pushed out of their bowls. They need their private little eating area so they can take their time and not have the piggier alpacas come and push them away. I had a few minutes to wait until they were done. All the water tubs had been scrubbed and filled so I had a few minutes to play. I had some pellets left in my bucket I use to distribute to the herd. Olivier was standing there at the gate looking hopeful for an extra handful or two of pellets. I decided it would be fun to go in and work with him on his touching the toy with his nose. I walked over the toy. Olivier remembered from last time what to do immediately. I clicked with my tongue since I didn't bring a clicker out. I didn't have to lure him or refresh his memory at all. He just started to touch the toy. His nose stayed about an inch or two from the toy so I decided he needed to back up after being clicked. I fed him at his chest so he would have to take a step back. Then he had to come a foot or two to the toy to touch between clicks and being treated. This step is leading us to put more distance between the toy and my goal of sending him from up to 10 feet away or further to the toy. Once I have him doing that well, I want to get similar toys that are different colors to this blue one. Maybe a yellow and a red toy will do nicely because I want something quite different to see if they can see and understand that they are different colors. I will begin putting a name to to the cue soon now that I see that Olivier really understands what I'm clicking him for. So this one will get called Blue Toy and that will be his cue to go touch this particular toy. Those few minutes of clicker training Olivier and watching his eager face that was just enjoying himself and our game turned my mood around completely. I left the pasture and finished up the chores with a big smile on my face and laughing and enjoying myself. I was enjoying the beautiful view and colors and telling everyone in the herd to have a good night. 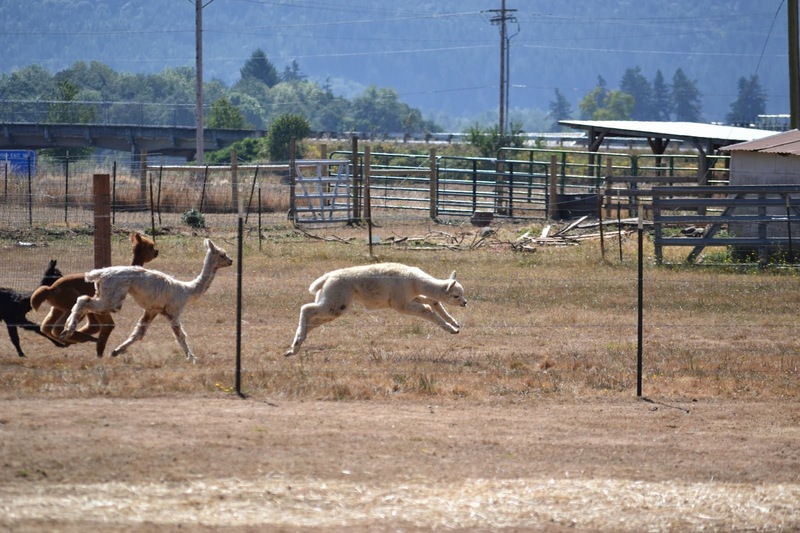 Clicker training may be a great way to teach the alpacas new behaviors, but one of the best side-effects is how good it makes the one training feel. It sure cured my cranky feeling I had most of the day. Maybe next time I will remember to go out and train an alpaca when technology strikes again! The boys really enjoy their toy. I took Olivier for his date last week. We were on hold getting him off the farm to his dates while we waited for the arrival of our last cria (who happened to be the first Olivier baby to be born!). Once Kipling was born, we were set to hit the road. He had a date about an hour from our farm. Olivier is my handsome guy that was I purchased from Hayley Jessup from Alpacas at West Ranch. He is such a gem. I just love this boy. 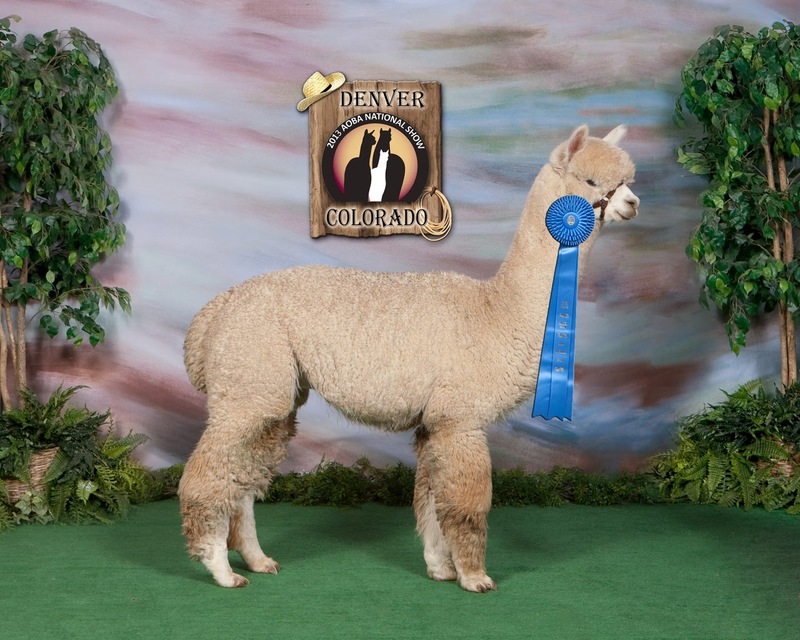 Not only is he an incredibly beautiful, statuesque alpaca, he has exquisite fine fiber that is keeping consistent and fine even after multiple shearings, plus he is the easiest alpaca to handle. He is such a joy to be around. He is curious and fun. I have been clicker training Olivier and he just cracks me up. I taught him to bow. I thought it would be a real hoot to take him to an alpaca show and have him win his ribbons and take a bow as the judge handed us his ribbon. I didn't quite get it perfected in time for last show season which is a shame. It would have been an even more memorable moment as he took his 1st place ribbon at Nationals to take a bow! Maybe we will have it down for next year's shows. I have also been teaching him to touch his carrot toy that I have hanging in their pasture. He really likes that game. Mowgli is better at getting the carrots out of it but having that toy hang there, gave me the idea of using it for the touch clicker game. Olivier picked up that game quickly. I lured him to the toy with a hand touch. Within a few clicks, he was getting the idea of touching his nose to the toy instead of my hand. Now when I go out to play the clicker game with Olivier, he isn't always quite sure if I want him to take his bow or touch the toy. So when he isn't sure, he does both! He first takes a bow and then touches the toy. You can just see the light in his eyes as he plays this game. He looks at me after he is done touching the toy as if to say, "Did you see me? I did it!" Last Friday, I loaded Olivier in the car. He is so easy and loaded immediately into my Honda Element. It fits an alpaca perfectly. We headed down the road. He has done this before so he wasn't too concerned yet he hadn't gone that distance before. His other dates have been more local. This one was just over an hour away. He was humming a bit so I often put the radio on when the alpacas sound anxious to see if the music helps calm them. I had it on a classic rock station. His humming got louder so I didn't think he liked that. I tried a different station that had lighter rock. Nope, still humming. I tried Country Western. Nope. Well of course my classy guy would want classical music! I turned to the classical music station and the humming quieted. He liked the Tchiakovsky symphony I found. We settled in on our drive having found a suitable channel to listen to and we tootled along Highway 5 until we reached our exit. The farm was only about 10 miles off the freeway. As soon as I got off the freeway, the humming started up again. He knew we must be close since the car's smooth pattern had shifted and he sensed it. I began keeping an eye on what roads I needed to turn on so turned the radio off and listened to Olivier's music instead. I talked to him as we got closer telling him how much he was going to enjoy the destination. I found the last road I had to turn on and Olivier stood up in the car. I told him we were almost there. He had been facing towards the rear of the car and looking out the back window on the entire drive until I made that last turn. When he stood up, he turned around and had his head looking out the front window. I was concentrating on looking for the address and driveway I had to turn onto when I heard a familiar sound in the rear of the car. "Oh Olivier! You couldn't hold it two more minutes? Really buddy?" I exclaimed. Ah well. That is why I love my Honda Element. It cleans so easily. I have rubber mats down too so even easier clean up. He finished his job just as I drove up the farm's driveway and arrived. He was at least cleaned out and ready for his date. I hooked his lead rope onto his halter and he jumped right out of the car. He looked around and we led him to the pen where they had his date all ready for him. It didn't take him long to figure out what his job was. His girl was very happy to see him too and they both got busy quickly. I enjoyed getting a tour of the farm while Olivier had his fun. About 45 minutes later, we were loaded up and heading back home. Olivier wasn't picky about music stations this time. He was quite pleased with the car ride now. We settled back to our drive home. He looked out the back window again watching cars and seemed very relaxed the entire drive. I was about 2 minutes from home when he stood up again and faced towards the front. Uh oh, I thought. I hollered at him we were almost home and to hold it but to no avail. I heard the tinkling again. I opened my window and drove up my driveway as he finished. I now know how long Olivier's bladder holds out! I had to laugh and shook my head as I walked him back to his pasture. The boys were eager to hear what happened. No fussing between them as I unhooked Olivier's halter. They seemed curious about Olivier's going and coming back. I made sure all was calm and set about finding my cleaning supplies to tackle cleaning out my car. Oh Olivier. You gotta love that guy! I said goodbye to a herd of 10 alpacas yesterday. 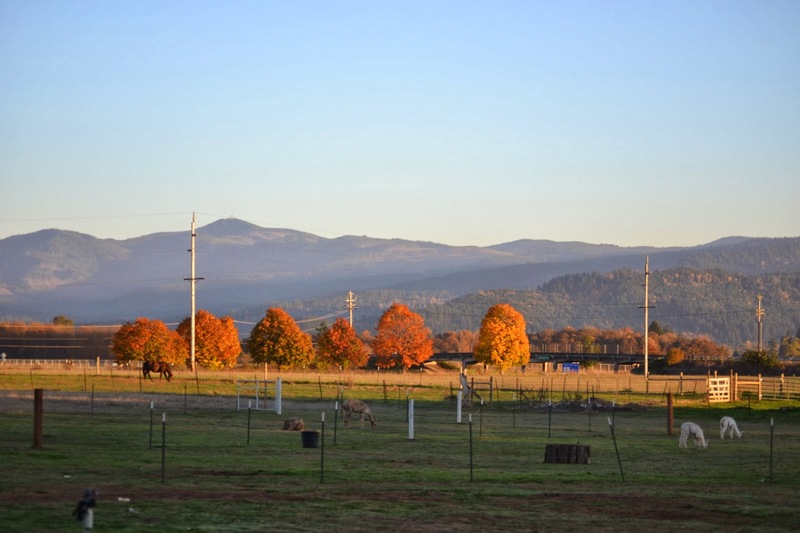 They were boarded on my farm while their new farm was being outfitted with a barn and fencing. This was such a wonderful job tending to this herd. Such sweet alpacas that were quite the characters. Nothing was more enjoyable than hosing this group down. They loved the hose and their kiddie swimming pool. It was a guarantee belly laugh every time the hose came out. This herd had been coming to my farm for temporary boarding for about two years. Their owners had owned a small place about an hour from me and when they went on vacation, they'd drop off their kid alpacas a day or two before they left. I was affectionately known as Camp Hum Sweet Hum. I remember the first time this herd came for their temporary stay. They are such a close-knit cohesive herd. They stem from two dams and it is their children and grandchildren that are all together still. They were quite skittish that first trip here. If one moved, they all moved. They looked like a school of fish how they moved around in their pasture. It took several days before they felt braver but none ever came too close to me. The second trip to the farm, they were a little more comfortable with things and they were getting to know Moose and the rest of the gang here. 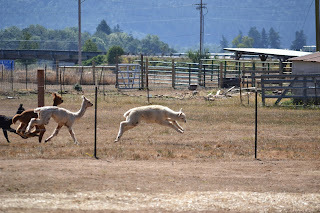 By their third trip to the the farm, they would race about the pasture pronking as their owners left. It was fun times here. They enjoyed the fruit during summer as I handed out apples. Their owners said they never knew about apples and they got their addiction while here. Although this group enjoyed the farm here and were comfortable, they never quite showed the affection they do with their owners. I was ok with that and never pushed them to do more. 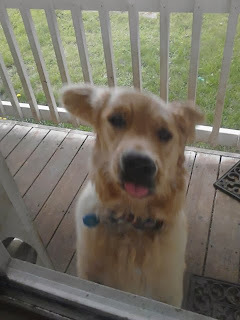 But, yesterday as I was haltering them up and talking to them about how much I enjoyed having them here and telling them they were heading to their new home and seeing their mom and dad again, several reached over and gave me kisses on my cheek. It was like they knew they weren't coming back. They are moving too far away for me to continue doing their temporary boarding when their owners are on vacation. Tears welled up in my eyes as they gave me their kisses and allowed me to rub their necks. 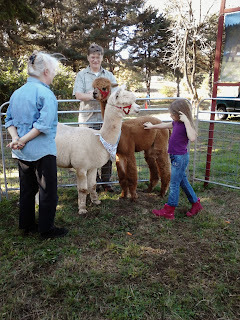 I'm happy their owners will have their kids home because they adore their alpacas, yet it was bittersweet saying goodbye to them. I so enjoyed having them here. 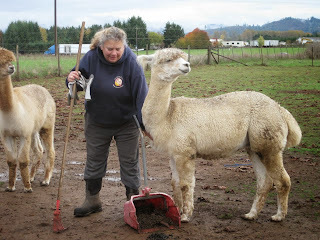 What a wonderful job that was to tend to such beautiful, sweet and easy alpacas and I got paid for it! When one door closes another one opens and I hope the next door that opens will be as sweet as this one. 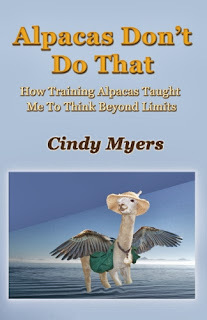 I'm so enjoying talking to people reading my newly published book, Alpacas Don't Do That. It is fascinating for me to hear what is catching the reader's attention. I was talking to someone the other day about my book and they were telling me that early in my book where I described having the talent of intuition is like being a good singer. Not all of us can sing well where others are born with an operatic voice. Those of us that should keep our singing in our showers know that no matter how many voice lessons we take, we will never make stage performers, and some with lessons can join choirs and really enjoy that but never still make it to having a top 40 hit. The same is true where intuitive abilities are concerned. Some of us are born more gifted and talented in that area. I believe we all have some abilities but they may be more like those who should only sing in showers (like me!). My description and using singing as a metaphor resonated with this person. They said how they are looking at their own intuition differently and when others describe their experiences of "coincidences" they are seeing the possibility of it being not merely a coincidence but intuition occurring. It was really exciting for me listening to this individual get excited about the possibilities of their own intuition and being less afraid of it. Coming from a society that is dominated by a sensate mindset is difficult when talking about intuitive experiences. Most people only believe things if they feel, touch, taste, hear, or see it for themselves. Listening and communicating with animals would not fit within that category! I know how frightening it was for me to admit that I could do those non-sensate, very intuitive things. Would I be marginalized? Be treated differently? Teased? Bullied? Dis-respected? I had a lot of concerns in the earlier days of opening up to my intuitive abilities. It helped me to read others' experiences and I found through the sharing of their stories, moments I could relate to that had happened to me. I saw trends of how their own abilities developed that were similar to my own. It wasn't something totally new happening if others had similar things happen to them. It gave me more confidence. Yet, those folks were still categorized out in the world. You go to the bookstore and they are in the metaphysical, New Age, Woo-woo areas. I was an engineer and not around a lot of those types of folks. It was a stretch for me. I had to live in two different worlds for some time and it felt like I lived a dual personality. For many years of being an engineer working for the government no less, that intuitive side of me was kept well hidden from my colleagues. But as I learned more about it, I found it helped me greatly in my work environment. I could read people's body language better and their energy. I could read when someone was not telling me the truth. Boy did that come in handy in negotiations. Instead of being afraid of my intuition, it became an ally. I have to say turning 40 was wonderful! There is something about entering into your 40's that you just stop caring what others think about you. You are what you are. If you like me, great and if you don't, that is fine too. I just don't need everyone to like me. It became a lot easier to be myself and allow others to see that side of me and how the intuitive side was playing a more important role in my life. Turning 50 only made that feeling stronger of really not caring what others think! I wouldn't want to go back to 20's or 30's because it is so freeing having this attitude. Having the ability to communicate with animals and doing energy work on them has been the best gift anyone could ever give me. So why shouldn't I just shout that out with pride and excitement that this is super cool! And, if by reading my book others get inspired or find confidence to open up and realize they too have this ability, that is even more super cool! Thank you all for sharing your experiences from reading my book. I so love hearing them. Send me more of what has resonated in you from reading my book. Send them to cindy@humsweethum.com. You sharing your stories helps others open up to their abilities too! I wrote my Master's Thesis on the grieving process and I used Dante's Inferno as the metaphor for going through grief. I could have used that epic poem for lots of other aspects of life too. Our personal growing process reminds me of the Inferno. The graphic of the spiral as Dante traverses the various layers of hell is so much how we grow or grieve. It isn't like we go through things once and learn and then bam, we are done. The metaphor of peeling an onion is more like the reality of growing. We learn one layer, take a break and then get another lesson and peel another layer away, etc. And quite often, it is something difficult that we are dealing with, a personal hellish experience, that provides the best opportunity for our psyches growth. Learning about alpacas has followed that same pattern. We seem to get cycles of events both good and bad happening on the farm. Each time, hopefully we learn from the previous experience and we can address things better, have more information, medicines, and tools available to deal with that particular issue. There is the left brain of learning how to do things that get evolved and the right brain's, intuitive and emotional aspect of our psyche is also worked. They don't always work together either. I may learn something fast with my left brain on how to do something, but my emotional brain tends to take much longer to get what I'm to learn from that experience. 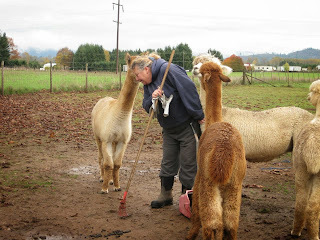 It is amusing to me that I sort out the emotional side of what I'm to learn quite often while I'm raking alpaca poop! I'm trying to figure out my own crap while dealing with real crap! It is real "Crappy Therapy!" Even though I joke about it, I am most sincere in how it has helped me tremendously in my personal growth. Being in the fresh air and moving about gets the blood circulating, both sides of the brain are engaged, yet it doesn't take brain power to rake. I have at least an hour or two of raking needing to be done each day too so I have dedicated time to just let my mind ponder over issues. I often come up with blog ideas as I rake, or I mull over marketing ideas and I also try and figure out why something is pushing my buttons. Lately, I've been given many signs to stay focused on being positive and grateful. It would be easy to look at what isn't going right, getting caught up in the malestrom created by American politicians and how it could affect me personally. But so many of those things are terribly negative and much beyond my control which only causes more anxiety. And if I allow myself to stay focused and concerned on those issues that I really can't help, I will only draw more of that negative energy towards me. It is a self-defeating method of thinking. But I have found myself being dragged into that thinking. I have been given wonderful reminders of staying focused on being positive. I saw on TV the other day as I randomly flipped through channels and stopped when a woman talked about being grateful when she is feeling the same way I have been lately. She said sometimes she has to force herself to go through the litany of things she is grateful for even when she isn't quite feeling so grateful. Her words hit me like one of those zings of an aha moment. So every morning and every time, I start getting upset with things that are beyond my control, I consciously and willfully stop myself by looking around and think of all the things I'm grateful for. It is so easy when I take a look at my beautiful alpacas and sweet dogs. The list grows and grows and I feel my heart filling up. I can feel less weight on my shoulders as I continue my list of things I'm grateful for and even turn those things that are creating anxiety into a gratitude if I can. I usually can find something to be grateful about. If nothing else, I know that feeling anxious won't last forever and I'm grateful for that! Since starting my gratitude lessons when feeling bombarded by negative thoughts from myself or others, I have suddenly started seeing more positive things come my way. 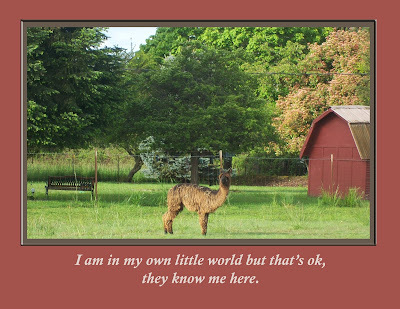 More of my Alpacas Don't Do That books are being sold and more doors opening up. Help that I needed to revamping my Website is in place, help getting my taxes and bookkeeping improved have come into being. Things that I wasn't doing a very good job on my own and knowing it, but not having the skill, energy or desire to remedy on my own. So gratitude thinking is wonderful. It changes our own perception and it draws those things we need to us that are positive. We draw the positive instead of the negative. And although being grateful won't stop bad things from happening, it helps when dealing with those cruddier parts of life when we have to traverse yet another ring of hell. 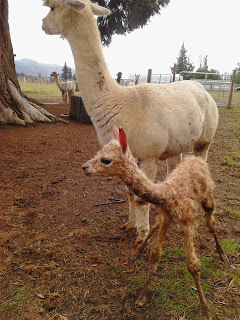 I'm Grateful For A Healthy Cria Who Is Such A Cute Baby Boy! I had Mowgli and Calvin at an event this weekend. I was so proud of my boys. They did well on their excursion out in public. I caught them early before my friend Ann came over to help load the boys. I haltered up Mowgli and he stood at the barn door waiting for me to open it. I was getting the two boys dressed in their halters and finish getting my supplies ready but Mowgli was all set to go. I had to laugh since I hadn't seen him do that before. He was eager and ready to go on an outing. The last time he was haltered, we went to a summer art camp for kids and he had so much fun that he was ready to go again! I don't always know how much fun they really have or are they just being tolerant with the activities. But seeing Mowgli eager to go out, I think he actually enjoys himself. The two boys were definitely the hit of the event. Everyone came over to see them and they got their bellies filled with carrots. A new person that came over would get their hands checked to see if there was a carrot in them. I'd make sure the hands would get a carrot or two and the boys were happy to engage. It is such a great socialization activity. The alpacas get to experience different ages, sizes, shapes, men, women, children, hats, smells and any number of other sensory stimuli on these outings. They seemed to enjoy it most when I would take them out of the pen to take them for walkabouts. They greeted people allowing pets and pats even on their heads. I'd try and get to people first and ask to make sure only necks or backs were patted but some would not hear or forget and go straight to the top of the head. The boys tolerated it with good humor. They got extra carrots and goodies for their patience. I took the boys home after a long time and I had to laugh on the drive home. It was like having two tired children in the back. If Calvin touched Mowgli by accident, I'd hear a spit being launched. Calvin didn't have much room and it was by accident. He wasn't trying to torment Mowgli but if he barely touched Mowgli, there would go another spit. "He's touching me!" I'd tell Mowgli to relax and it was an accident and no spitting in the car. Then they'd settle down and look out the back window. I was the stereotypical mom keeping arguing children calm in the car. We got home and the boys were quite happy to be home with their herd mates. They were greeted at the gate but no male pecking order fuss happened. All were happy to see each other and catch up on the news of their outing. It was a fun day had by all. And like all outings that are fun to go out on, it is even more enjoyable being home. Naomi's Watched Pot Boiled! It's A Boy! Leave it to Naomi to make it an exciting day at Hum Sweet Hum. At feeding time last night, she looked ready to birth any time. She was very lax and poofy on her backside. Her milk was in and I could see the baby's head pushing up against her rear end. She was quite open even and I was concerned that perhaps she was already in labor. So I checked on her a couple of times through the night. It was cold so I didn't want to leave a newborn that was damp in that cold for long. Alpacas don't usually have their babies in the middle of the night but it has happened so I wasn't leaving it to chance. But, come daylight, there was still no baby. I watched Naomi go to the poop pile a couple of times and I thought perhaps we truly were going to have this baby finally today. As I mentioned in the last blog, Naomi is one that does not want an audience. I went into my house to keep an eye on her from inside so she couldn't see that anyone was watching. After going to the poop pile as she walked out to the big field, she began grazing. I worked at my computer which is by a window where I can watch my pastures. I kept an eye on her for a couple of hours and she just grazed. No extra trips to the poop pile. No up and down, lying down and then rising like the expectant moms do when in labor. I didn't see any signs other than that one peek of her poofy behind earlier. I got to thinking that it was just another false alarm. After several hours of no signs of labor, I decided to run to the feed store. I was almost out of their pellets and a few other items. It isn't far from my farm so I jumped into my car and ran my errand. As I drove down my driveway, I had another good look at Naomi. She was grazing away but lifted her head and looked at me and then went back to eating. I sighed and left for the store. It is no more than 10 minutes from my house and all I do is get my pellets and load them in the car which takes maybe 5 minutes if there is no one in line ahead of me. I was home in less than a half hour. 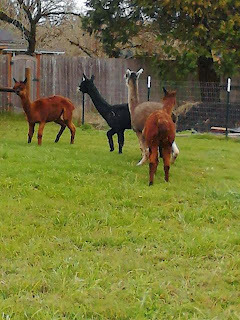 As I drove back up my driveway, I see something new laying in my field and several alpacas surrounding it. It's a baby! That stinker Naomi took advantage of me leaving and quickly delivered her baby. She is the stealth deliverer! I jumped into my boots and hurried to the field. I found a little fawn boy in the sternal position already. He was shivering so ran to the barn to get some towels to dry him off a bit and warm him up. What a cute little guy and I was so thrilled. A healthy baby with no fuss and need of assistance being born! I waited until Naomi passed her placenta which only took her about 15 minutes after I arrived home, then picked up her little boy and she followed me back to the barn where I could work on drying him up. It was a cold fall day here in Oregon and the hardest part of the little guy's birth was warming him up. But three jackets later and a hot water bottle next to him under a towel as he napped, he finally stopped shivering. 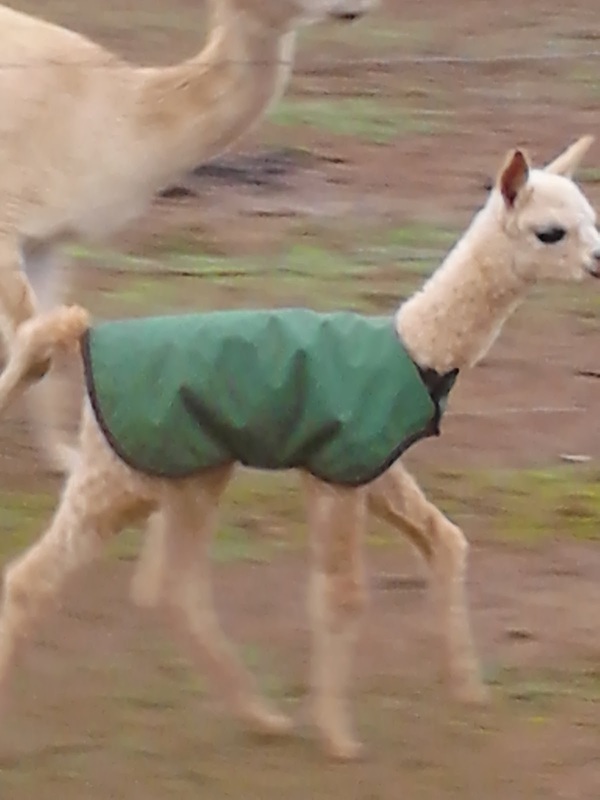 He figured out nursing quickly and has nice straight legs and very bright eyed as he looks about. What a sweet boy. Naomi and Olivier did a great job. Now the hard part is to figure out a good name for our newest addition. I will be up a couple of times during the night I'm sure. I always do even with no issues. The over-protective worrier in me needs to put my eyeballs on these new babies every couple of hours or more if there seems to be an issue. I won't fully stop worrying for a day or two until I see all the normal things going on and know that mom and baby are fully bonded and can find each other easily. But there still feels like a big weight has been lifted to know that the pot finally boiled and I'm done with cria watch until next year. It's A Boy! Naomi and Olivier's baby is born.